Buying any instrument should involve a bit of research to ensure you are purchasing a product best suited to your needs. Whether you are a beginner or a professional, choosing the best tenor ukulele to advance your playing can be something of a challenge. A challenge made easier by our guide and collection of some of the very top models on the market, as we’ve thoroughly reviewed and recommended tenor ukuleles to suit every player and budget. What Is a Tenor Ukulele? 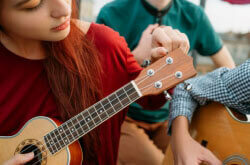 Who Are Tenor Ukuleles For? Is a Tenor Ukulele Good For Beginners? How Much To Spend on A Tenor Ukulele? Before we dive fully into specifics and in-depth tenor ukulele reviews, here are three great picks that you should consider when choosing the right instrument for your needs. If you are already a ukulele player or a fan of music which uses the ukulele frequently, you may know that ukuleles tend to come in four different sizes: soprano, concert, tenor and baritone. Tenor ukulele is the third largest in terms of body size, and the largest ukulele which is tuned to the traditional ukulele tuning, as the baritone is tuned more like a guitar. Tenor ukes, due to their size and acoustic properties, have more of a full sound, covering more frequencies than the soprano and concert ukuleles. The tone is closer in some ways to a classical guitar tone due to the fact that the lower frequencies ring out more. 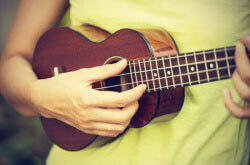 Because of this, a lot of musicians are beginning to prefer the tenor ukulele. It is better for solo performances due to its thicker sound, and they also tend to have longer necks, which means more frets to play with. Of course, the size doesn’t just have implications to the sound, and a slightly larger tenor ukulele may feel more natural than playing a tiny soprano model. To be exact with sizes, tenor ukuleles are generally 26 inches long as opposed to 21 or 23 inches for soprano or concert. The size difference may not sound like much, but it has a big impact on the sound and the playability. Some models may be slightly longer or shorter than 26 inches, but this is generally the size a tenor ukulele will be. Tenor ukuleles are popular among larger players due to the fact that they will probably feel more natural to hold. They are also popular among people who want to play the ukulele solo at times, or even perform on it, as it will cover more frequencies and generally sound a lot more satisfying on its own. Generally, it boils down to preference and which tone of ukulele you prefer. Due to the fact that there is no difference to the way the tenor, concert and soprano ukulele are played then there is no significant disadvantage to learning on a tenor ukulele. The fact you have a little more space on the fretboard may actually make it easier to move around and more comfortable, so it is very popular that beginners opt for tenor ukuleles over some of the other types. The only downsides for beginners are the fact that tenor ukuleles are slightly more expensive due to the materials used. You can buy an entry-level soprano ukulele for cheaper than an entry-level tenor ukulele. As well as this, if you do ever plan to move to the smaller models, there will be a period of getting used to the smaller fretboard. This is not a huge disadvantage, though, and if you plan to move from one type to another there will always be some level of adjustment needed. There are some brilliant brands out there making ukuleles. 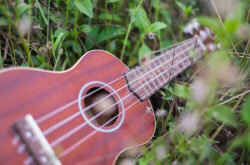 Many of them have Hawaiian sounding names due to the fact that ukuleles hail from that part of the world. The companies making tenor ukuleles are split between these older brands, and newer brands who have expanded from making guitars to making ukuleles too. For instance, Fender and Martin make some exceptional guitars. Traditional high-end ukulele brands include Pono and Kanilea, with other brands such as Kala, Mahala and Luna offering both mid-range products and even starter kits which often contain spare strings, tuners, cases and plectrums among other items. Naturally, people all approach buying an instrument differently, and with different budgetary constraints. In general, though, there are some very rough rules to how much you should spend depending on what you wish to get out of your instrument. If you are a beginner or newcomer then you can probably get a tenor ukulele kit for under $100. Some of the items we’ve recommended below are ukulele kits, which come with everything you need to get started. While you probably won’t be playing any large gigs with $60 ukuleles, they are great for those who are making their first steps into playing. If you have some knowledge already or are looking to move into a more advanced level, then you can purchase models from around $100 to $300. These products are what we will call ‘mid-range’ and tend to be a step up from beginner models in terms of tone and build quality but not quite up their with elite models. Elite models can be $500 or more. There are some incredibly good quality ukuleles out there. Built exceptionally and beautiful looking, with good quality wood for both tonal and aesthetical advantages. Instruments at a high-end level can be extremely expensive, and ukuleles are no different, however if you plan to be the best, only the top quality ukuleles will do. On to our full tenor ukulele reviews. Only the highest rated tenor ukuleles have been considered for this list, with all of the tenor ukulele recommendations being based on our opinion as well as other consumer reviews. We wanted to include a good cheap tenor ukulele on the list, and the Donner DUT-3 certainly fits the bill. The product is sold in three different sizes, with the 26-inch model being the best for that rich, tenor sound. While its sound doesn’t quite compete with the products which cost three or four times as much (naturally), this is a good value for money tenor ukulele with a lot of great features going for it. Beautiful inlay design on the fingerboard in a sunburst theme which make you think of Hawaii. Comes with a tuner, strap, case and spare strings. Chrome tuning pegs similar to those you would find on a classical guitar. They make it easy to keep your ukulele in tune at all times. Made with a mahogany back and sides and a spruce top, with a comfy rosewood fingerboard. The strap included is not the most sturdy or well-made, so it may be worth investing in a better quality strap. The strings are okay for beginners, but not the top quality strings you will want for performing or recording. Generally, this is an unpretentious yet good quality ukulele. Not designed to last a lifetime or be played on stage in front of thousands, but great for beginners and those on a budget. No list of good tenor ukuleles would be complete without products from Kala. Their range is absolutely huge and in general is full of excellent quality. One of the best reviewed ukuleles in their range is this, the KA-15T tenor ukulele. This is not among the most expensive products in their range, either. In fact, it is pretty affordable and is one of the best tenor ukuleles under $200. It is sold as a kit just like many of the best beginner ukuleles, so comes with accessories too. Geared tuning pegs which help the ukulele stay in tune for a long time. Comes with an easy-to-use digital tuner. Made from Mahogany wood with a Walnut fingerboard. Some consumers have reported buzzing and noise around the tuning pegs due to the decorative finish. Kala is a very good ukulele brand, and to be able to find a product such as this at such a good price is rare, this is why we have described this particular ukulele as the best value for money out there. The consumer reviews are exceptional, and playing this gorgeous mahogany ukulele feels like you are playing an instrument three or four times more expensive than it actually is. Yes, it is the same Fender we all know from decades of guitar manufacture! Their range has continued to expand and they offer many other types of stringed instruments now. With such a big brand name and influence it is little surprise, but the Montecito ukulele is not just there for the sake of it. Fender has managed to manufacture a good quality ukulele, somewhere in the mid-range of the prices currently on the market. Made completely out of Koa, the traditional wood made to create tenor ukuleles in Hawaii. A hint of Fender rock and roll with the Fender telecaster style headstock. Beautiful tone and warmth thanks to the wood quality and Fender’s design. No-tie bridge makes changing strings as simple as it can possibly be. Solid top for a beautiful sustain and resonant tone. Some users have reported it going out of tune more frequently than other ukuleles. Fender are loved by musicians the world over, and they really have infused elements of their brand into this ukulele, with the telecaster-style headstock being a real highlight. This isn’t just there for novelty value, though. The manufacture has been true to the roots of ukuleles, using Koa wood for amazing tone and resonance. The Montecito isn’t cheap, but it has a rich and wonderful sound. Martin is another brand known for creating some of the best guitars in the world, especially acoustic guitars, but they’ve actually been creating wonderful sounding ukuleles for over 100 years now. The T1K is another model which is made of Koa wood, the best Hawaiian wood to achieve the ukulele tone we know and love. Top quality workmanship and build-quality with only the finest wood used. A lovely rich tone which lets the high frequencies really ring out. Finished with exceptional satin lacquer. No strap buttons for attaching straps to play standing up. Included gig bag could be better quality and offer more protection. When you buy an instrument with the word “Martin” written on the headstock, the chances are you are going to be impressed with the sound. The intonation of this ukulele as well as the exceptional build out of authentic Koa wood means that it is possibly the best sounding tenor ukulele out there. Another Kala ukulele. This is another mid-range ukulele in terms of cost, but is one of the best tenor ukuleles under $300 and has some unique features which may appeal to some. Though it has a classic design in terms of looks, and the quality we have grown to expect from Kala, the fact that this is a mahogany ukulele means it has some different sound qualities to many of the Koa ukuleles we’ve already mentioned. Because of this, its sound is perhaps closer in some ways to a classical guitar in terms of the frequencies which ring out. Beautiful warm tone which sounds great even when played solo. Smaller than some of its competitors but still feels comfortable even if you have large hands. Mahogany wood construction with a walnut fingerboard. Rich sound when dropped into “low-G” tuning. Does not come with a case whereas many of the ukuleles reviewed do. 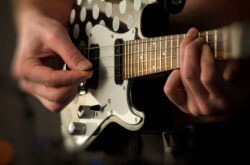 Some users have said that the strings can have a sharp tone when fretted towards the body (E.G soloing). This ukulele is a brilliant example of the fact that different models can offer the player different tones. The mahogany tone is vastly different to that of Koa and is much more mellow. One is not necessarily better than the other, but for a full yet mellow sound that is great for playing chords, the KA-SMHT certainly has its place. In spite of the name of this product being ‘professional’, it makes it into our list of the top tenor ukuleles due to the fact that this is a great budget option for beginners. In fact, it is one of the cheapest tenor ukuleles out there, but that hasn’t stopped it getting rave reviews. Available in seven different colors and designs making it popular among kids and beginners. Made from mahogany with good audio qualities and a mellow sound. Put together by hand using good quality materials. Comes with a branded gig bag. Strings are of quite poor quality. Prone to going out of tune after a few uses. 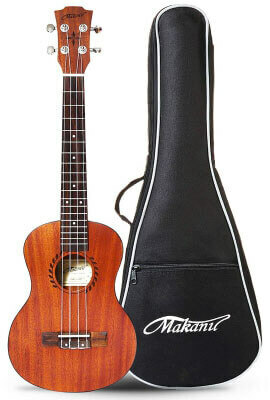 If you are buying the Makanu professional tenor ukulele then it is important to have realistic expectations. This is definitely a product aimed at beginners and while the tone, playability and robustness are all pretty good, they’re not going to win any awards. However, some people are just searching for the best cheap tenor ukulele, and this might be a good option that comes in well under $100. 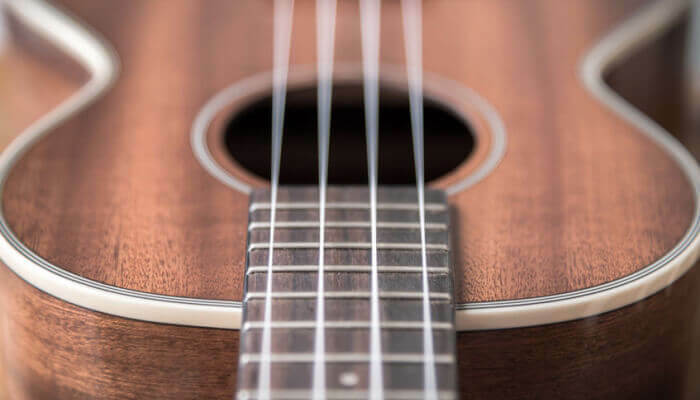 This article is all about giving different options, and we simply couldn’t ignore this tenor ukulele which, in spite of one key difference, has a lot of great reviews. This is an eight string ukulele! Basically, this means where every string would be on a standard uke, this has two strings close together, tuned to different octaves. This gives a much thicker sound and is popular for people playing chords. Thick and rich sound from the extra strings, covering more octaves. Lovely resonance from the mahogany body. Choice between rosewood and engineered wood for the fretboard. Exceptional craftsmanship for the price. Can be tricky to play and to tune for beginners. Not sold with any accessories. The bridge may struggle with the tension of the strings over time. There are definitely positives and negatives to a product like this, and it is a little “out there” for some, but the concept of a 12-string guitar is very similar, and those are extremely popular. The sound of the Oscar Schmidt OU28T-A-U 8-String Tenor Ukulele is something to behold, even if it is tough for beginners to get to grips with. Ukuleles can be acoustic electric too! Just like guitars have taken advantage of this technology, ukuleles are starting to do the same, and the Kala KA-KTGE-C has so much going for it alongside its electronics, which make it really easy to amplify and play through PA systems in front of lots of people. Cutaway neck to make for easy playing close to the body, including soloing. Made mainly from Hawaiian Koa with a mahogany neck. Gives off a lovely, bright tone which works well either solo or in a group. Has a built-in tuner which is easy to use due to the acoustic electric capabilities. Low action designed to help people moving from guitar to ukulele. In spite of being such a good ukulele, the strings are relatively poor quality. This is another example of a Ukulele that can offer something a little different, and the fact that it has a unique cutaway design and the ability to amplify or even run through effects with ease mean you can see why it would appeal to guitarists. As we’ve already mentioned, Kala is one of the top manufacturers of ukuleles and this model even comes with a one year warranty. It’s yet another Kala. This model, though, is from a different part of their range, the Kala Elite product line designed for professional musicians and those who aren’t afraid of spending some money on their hobby. The 3KOA-TG is one of the most expensive ukuleles out there. As you would expect at this high-end price point, there are some impressive features and a truly wonderful, striking sound on offer with this uke, but do these justify the price tag? Made from premium-grade Koa sourced in Hawaii with a Honduran mahogany neck. Comes with excellent quality Kala strings made of fluorocarbon. Beautiful ebony fingerboard with inlays made from mother-of-pearl. Built with incredible craftsmanship and comes with its own hardshell case. Extremely expensive, even with all of these features. For sound and looks, this instrument is close to being faultless. It is one of the best sounding tenor ukuleles you could wish for. So why has it not made it to our ‘best of the best’ listing? Well, there’s not much to tell between this and the Martin T1K model recommended. They are both close to being 10/10 products, but the fact that the Martin is much more affordable means that it gets our nod of recommendation. It is half the price in some places. The Kala Elite is still a truly wonderful option, and a professional option too. If you are a touring musician who doesn’t mind spending a little extra for this craftsmanship and the Kala Elite name, this could be worth a second look. As this guide will show you, there are a huge variety of instruments within the “tenor ukulele” category. Choosing which one is best for you will come down to spending a little time educating yourself on the products, as well as considering your own unique needs. Whether you are looking for a passable model to see if you like playing the uke, or you need something to take on a world tour with your band, there are suitable products listed above, as well as a wide spectrum of others in between. It is easy to see why tenor ukuleles are growing in popularity, and the right models can be a lot of fun to play. Choosing a good ukulele can be the difference between sticking with the hobby until you are a virtuoso, or giving up after one week. Be sure to consider the pros and cons carefully before you make your decision!